In Rogue & Gambit #2, Kelly Thompson and Pere Perez spend most of the issue exploring the Merry Mutants’ southern belle and their Cajun scoundrel’s history more than the book’s larger nefarious mystery and that’s precisely why I am enjoying this miniseries. The first issue set Rogue and Gambit up on an undercover mission at a couples counselling resort. Mutant couples have gone missing at a new getaway and the X-Men’s head honcho, Kitty Pryde, wants to know the skinny. So she sends everyone’s favorite on again/off again couple to investigate. 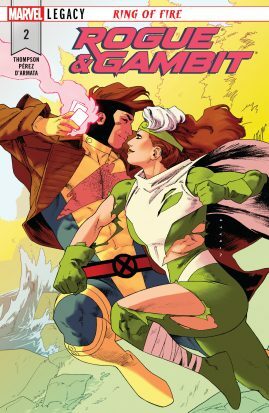 Rogue & Gambit #2 delves into how the two heroes met and like their X-compadres, it’s complicated by a Chris Claremont plotline. See, Rogue and Gambit met while they were under the influence of the evil psychic manipulator, the Shadow King. Gambit counts this as their first meeting whereas Rogue feels the first time they met was shortly after, when the X-Men and X-Factor defeated the Shadow King during the Muir Island Saga. Thompson’s dialogue and Perez’s storytelling flesh out Rogue and Gambit’s views on the start of their relationship. The way Rogue and Gambit view their first meeting(s) colors their entire relationship. Rogue feels that the Shadow King’s influence colors and perverts their meeting and prefers to think of the time after as when they really first met whereas Gambit sees his feelings for Rogue as something that broke through the Shadow King’s control. The nature of Rogue’s power (absorbing people’s memories and powers via touch) requires an intense amount of self-control. Knowing that a monster like the Shadow King controlled her when she met the person who she loves fills her with dread, but Shadow King or not, she loves him. Thompson and Perez provide a masterstroke in a double-page splash while Rogue and Gambit are in couple’s therapy. It’s the kind of storytelling that only works in comics. Rogue and Gambit detail the ups and downs of their relationships through art in the word balloons. It’s a heckuva splash! Our Merry Mutants come across some super-powered security while sneaking around the compound which leads to a tease for the next issue. Issue one was mostly plot with some character while issue two is more of a character study. Thompson and Perez are giving these characters their long deserved due and it’s a joy to read! It’s so great to have good X-Men comics again! 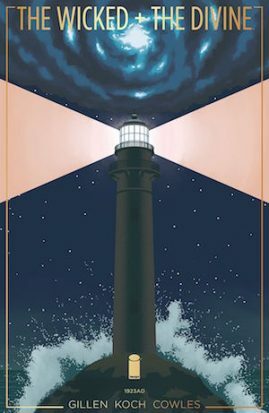 So begins the major action in the latest WicDiv one-off special, featuring the 1923 Pantheon, last seen in issue #1 of the regular series. At its most basic, the issue is a rollicking whodunit murder mystery featuring a full Pantheon (albeit briefly, as evidenced by Lucifer’s early demise). At it’s most complex, it’s a richly poetic rumination of the value of art both high and low, and how that art can steer the world to either ruination or redemption. Almost half of the issue is mere text, allowing Gillen to fully develop each of the twelve (or fourteen to fifteen, if you count each of the Norns and Ananke) gods in detail. Small chapters of prose are split up with brief interstitials of Aud Koch’s sepia-toned artwork, carefully accented when necessary with savage smears of red. While at first I found tackling so much text daunting, I eventually came to appreciate the format – The Wicked + The Divine is a comic book that has never been afraid to play with form (the in-universe magazine that was issue #23 remains one of my favorite single issues of a comic book of all time), and once I had taken in a few of Koch’s panels I realized I may not have been able to handle an entire issue of her artwork, each interlude proving so richly dynamic that I could easily imagine my head and heart exploding from the beauty of a fully-stocked issue. I consider Jamie McKelvie, the series’ regular artist, to be a master of facial expressions, which makes him a great match for Gillen’s realistic use of subtext in his characters’ dialogue. Koch is equally great on that front, though she adds her own playful obfuscation to the gods’ expressions, making it nearly impossible to glean what anyone is really thinking or who, if anyone, is telling the truth – a requirement for any good mystery. Setting the story in 1923 – the eye in the hurricane of World Wars – is a masterstroke. The twenties were a flashpoint for advances in technology and art, and artistic advancements loom large in the motivations of the gods, both murderous and non. How much of great art is born of global suffering, and how much global suffering can great art assuage? Does it matter if it pleases the masses more than the scholars, critics, or other artists? Is any one type more valuable than another? 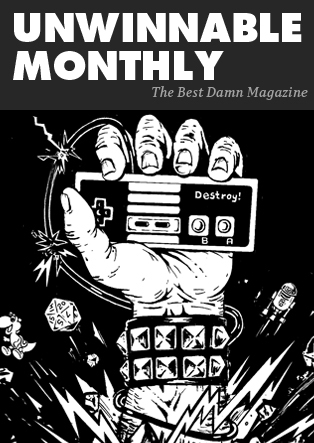 These are heavy explorations to tackle in a comic book – an art form that is close to but still hasn’t quite escaped its “low” status. Truthfully, there’s no better book than The Wicked + The Divine to take them on and tellingly, there’s no better time to take the conclusions we draw from them to heart.